We have received 6 consecutive years Trip Advisor Certificate of Excellence 2013-2018 + Hall Of Fame 2018, enjoy a special day out whilst visiting London. 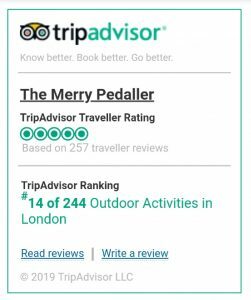 We visited London, and want to experience the surrounding by bike.With The Merry Pedaller, we found a warm, well prepared and beautiful tour and tourguide.Nice stories tuned to the public including a nice Englisch lunch.So nice to experience England this way! Ginnete was a wonderful host and guide. This was one of the top experiences for our trip to the UK. 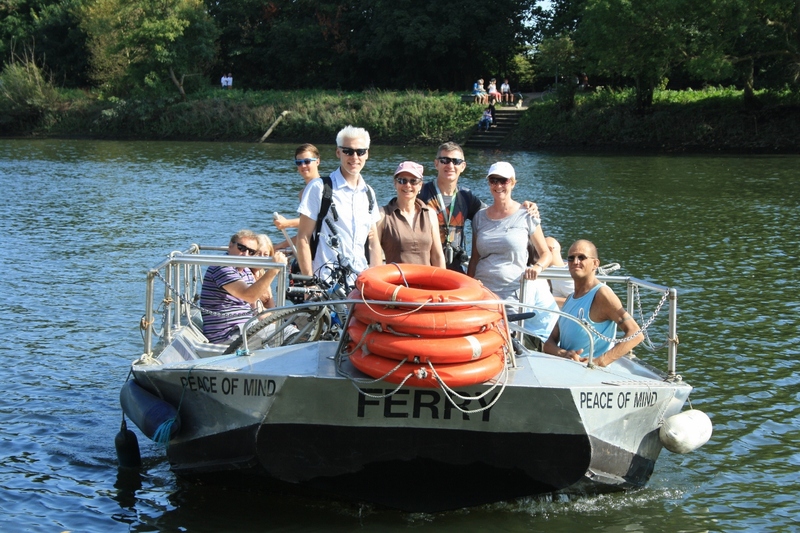 We rode along the Thames to Hampton Court this summer. Highly recommend her tours. We throughly enjoyed our day out touring the countryside. Ginette, was well educated local history and pleasure to be with. My husband and I throughly enjoyed our cycle ride with Ginette. We felt immediately at ease in her company and she was extremely knowledgeable about the area we cycled through. Bikes and helmets were provided and we stopped for coffee and then for lunch that we bought on the way. A perfect way to spend a few hours. My twelve year old son and I had a fabulous morning on the Hampton Court Palace Bike Tour. Everything was great – the bikes, the countryside, and of course, Ginette! Ginette is a wonderful guide, so not only did we have fun riding bikes but we also learnt so much about the architectural, cultural and natural history of this beautiful area. She also supplied us with a bottle of water for which we were very grateful. (My son was also very grateful for her recommendation of a particular milk shake shop on our pit stop!) This tour was a definite highlight of our holiday! Absolutely enjoyed the bike tour. Although the weather was not perfect, it was still a great way to explore the area nearby London. The places where we stopped for a drink were well chosen! Definitely will come back! It was absolutely wonderful to explore Richmond’s beautiful and very British, to my imagination, parks and gardens together with Ginette this week. Thanks to Ginette’s love to these places and knowledge it was probably the best time of our London visit. Weather was fantastic of course, but I imagine it’s beautiful there in almost any season. And the deer laying calmly right across the road! If I have a chance to get there again – I would definitely go for a longer tour, not just 3 hours – time runs so fast 🙂 Warmest regards to Ginette from Moscow! This was a very easy day trip from central London but such a contrast! Ginette modified a couple of her standard tours to reflect our interests – more cycling, more country. We saw (among other things) a polo match, palaces, wild deer and had lunch in a “country pub”. I guess the biggest indicator of the tour is would I recommend it to my best friend – yes I would and yes I have already done so! With a day to fill in before my evening flight, I booked a bike ride in Richmond with Ginette and the Merry Pedallers. London turned on a near perfect warm & sunny day and Ginette improved on the experience by being a delightful and an engaging host. She provided an excellent historical commentary and background detail as we rode through the Richmond Royal Deer Park. I really appreciated Ginette’s willingness to do this ride for me on a day that was not a published ride day. We rented the bikes to participate in the Tweed Run 2018.They were kind, caring, patient, helpful and very very nice. They met all our requests. I advise you to contact this agency. Everything is perfect. We had a simply marvellous morning cycling along the Thames from Shepperton to Staines watching the first day of the stately procession of the Swan Uppers, dressed in formal attire, in their six skiffs and accompanying motor launches as they row down the Thames to mark the new cygnets. The Swan Uppers finish five days later in Abingdon, Oxon.